There are many details to attend to in a divorce from child custody arrangements to dividing the marital assets. With the upheaval and chaos that a divorce can cause, it may be easy to overlook seemingly small details such as motor-vehicle insurance. A couple who is getting divorced should separate their car insurance policies. A couple should not separate their insurance policies until they have separate residences, however. Once the couple has established separate living arrangements, it is time to separate the vehicle insurance. It is important to note that an individual cannot be removed from a car insurance policy without that person’s consent. In most cases, the insurer will ask for a signed request, also known as a removal request. One party will need to obtain a new insurance policy. In most cases, the first person named on the original policy will keep that policy and the second-named person will establish a new policy. It is not necessary to use the same insurance carrier; in fact, it might be a good time for an individual to shop for a more competitive rate. If one party is being uncooperative and will not sign a removal request, it can hinder the process of separating the policies. One way to work around this is to leave the uncooperative party on the insurance policy. The other party can then sign the removal request and establish his or her own insurance policy. Many insurers require the driver who is insuring the vehicle to be listed on the title. If there is a co-owner, such as an ex-spouse, who does not live in the same residence, then he or she would need to be listed as an additional insured. The simplest arrangement would be for each party to have his or her own vehicle with a separate title. Timing is important in regard to establishing a new insurance policy. It is important to set up the new policy before removing a driver and vehicle from an existing policy. All parties should be informed of any changes to a car insurance policy. Otherwise, someone may get behind the wheel when he or she is not covered by insurance. If there are any other drivers, such as teenage children, it should be made clear which insurance policy will cover the underage driver. In most cases, the parent who has primary custody will provide the car insurance coverage. However, insurance coverage could be the responsibility of either parent. For example, a non-custodial parent could agree to provide insurance coverage as part of his or her child support obligation. These arrangements could be spelled out as part of the divorce agreement. It is worth noting that teenagers are considered a high-risk group; therefore, insurance policies for teens are more expensive. Statistics published by the Centers for Disease Control, drivers between the ages of 16 and 19 are four times more likely to be involved in a car accident than older drivers. 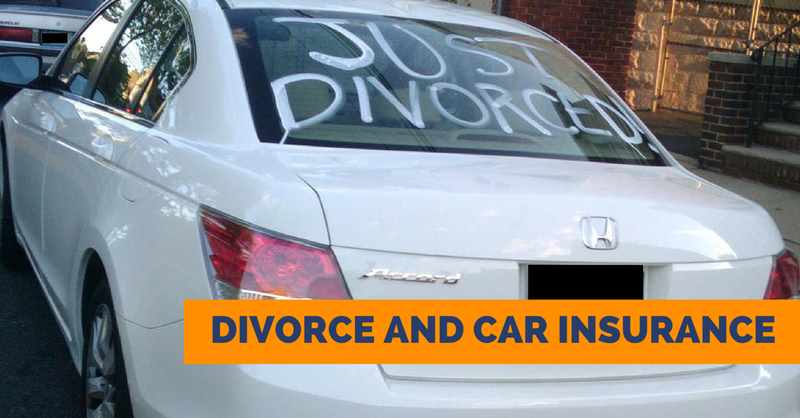 The best time to separate car insurance is after the divorce has been finalized. One reason for this is the possibility of a reconciliation. If a couple decides to work on their marriage and not divorce, then the separated policies will need to be recombined. Waiting until after the divorce is final will mitigate the risk of needing to recombine insurance policies due to a reconciliation of the relationship. A lawyer with a background in divorce cases and family law may be able to point out other frequently overlooked details such as car insurance. In addition, a lawyer may help negotiate with a difficult or uncooperative ex-spouse. For instance, a lawyer may be able to get an uncooperative ex-spouse to sign a removal request in order to separate the couple’s car insurance policies.